Elizabeth Hurley was the star attraction of this sparkling Mayfair event, where she switched on the Shepherd Market Christmas Lights. Our client, Pastor Real Estate, sponsors this annual event, which is supported by all the local businesses in Mayfair. Our PR team, in particular, Freya Olsen and Muriel Penoty, worked exceptionally hard to ensure that the event was well publicised in Mayfair and London, as well as national publications and online platforms. The team had great success, with highlights such as Elizabeth Hurley on the front cover of the Mayfair Times, substantial pieces in Mayfair Life, the Resident and The Mayfair Magazine, and articles in The Telegraph, the Sun, the Daily Mail and Monaco Life. All in all, they’ve achieved 32 pieces of publicity, with more still yet to be published. This public event had entertainment for the local crowd, with live acts who performed all around the piazza. 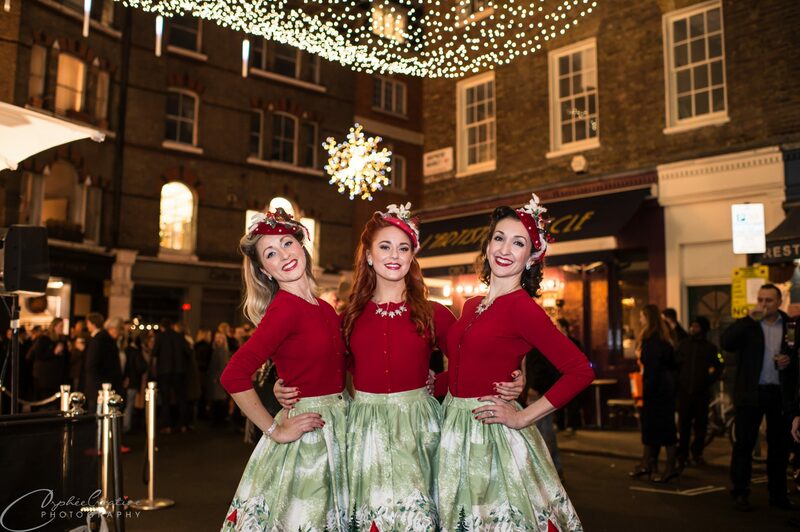 The Spinettes, three vintage-dressed ladies who sung classic songs, and an electric violist, Sarah Mallock, who travels the world with her talent, were particularly popular. Magicians and street performers also entertained the people. The weather was unusually warm and dry, which ensured a great turn-out. Upmarket food and drink were provided by all the local Mayfair establishments, including complimentary mulled wine from Little Square restaurant and Ye Grapes pub. Donations were collected for the homelessness and housing association charity, St Mungo’s. Pastor Real Estate support events in the local community of Mayfair, where they have just opened a second office, specifically for sales, on 11, Curzon Street, which is opposite their lettings/architectural/property development office at 48, Curzon Street. Pastor Real Estate deliver services with precise attention to detail and the greatest attention to customer care. The ability to provide such a comprehensive and integrated range of property services singles out Pastor Real Estate in Mayfair, and prime central London, as a truly exceptional and specialist property company. Pastor Real Estate, through the Monaco based J. B. Pastor & Fils has over four generations of experience and expertise in property development and management. Pastor Real Estate operates across prime central London, with particular focus on Mayfair, Marylebone, Knightsbridge, Belgravia, Kensington, Chelsea and Fitzrovia.